Vauxhall has introduces a new special version of its Corsa VXR hot hatch - the Blue Edition. Following on from the recent revisions to the Corsa range, this newcomer gets new styling features, extra standard equipment and special blue paint. The VXR and VXR Blue have new ‘Eagle-Eye' headlamps and a signature bar across the grille, coloured in blue. But in addition, the VXR gets a more aggressive front end, with deep set fog lamps, a wider and more prominent grille and a low, sculpted front spoiler. Inside, there's blue detailing, including the stitching on the leather steering-wheel, the air-vents and the trim on the Recaro seats. The engine remains unchanged so it's powered by the same 1.6 Turbo, producing 192bhp which gives a 0-60mph time of 6.8 seconds and a top speed of 140mph. An overboost feature increases maximum torque to 260+Nm when the power is needed. The Corsa VXR Blue also comes with lowered sports suspension, uprated brakes and switchable Electronic Stability Programme (ESP). And at £19,425 (including 20% VAT), the Corsa VXR Blue undercuts key competitors like the Citroen DS3 R and the MINI Cooper Works. Included in its price, this limited edition model features Arden Blue metallic paint, 18-inch alloys, dark-tinted glass, bespoke interior air vents and Recaro seats - that equates to a £445 saving compared with the cost of speccing a ‘standard' Corsa VXR with this kit. 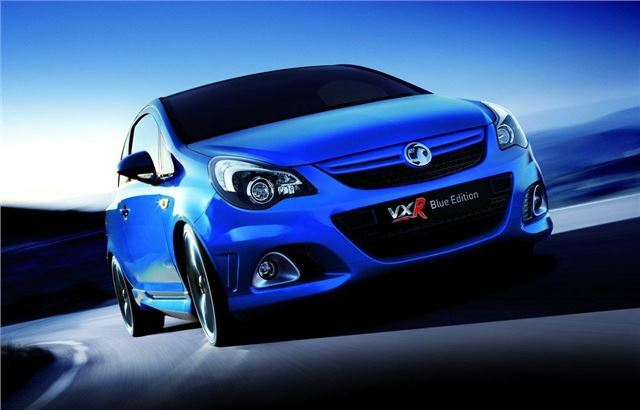 Available to order now, the Corsa VXR Blue will hit dealers late February.